In this video, I build a DIY CNC table and tool storage cabinet. 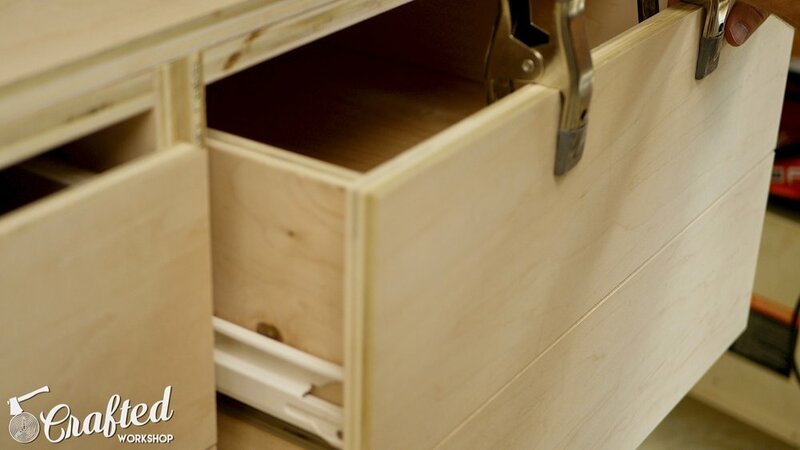 The purpose of this cabinet is to house my Shapeoko 3 XL CNC as well as add tool storage. The workstation would also be perfect for benchtop tools such as a benchtop drill press, lathe, bandsaw, etc. The cabinet is built from 3 sheets of ¾" plywood and 1 sheet of ¼" plywood. If you’re interested in building this CNC Table & Tool Storage Cabinet, I have plans available. The plans include a SketchUp file, a detailed cut list like you see here, and a cutting diagram, which helps reduce waste from the plywood sheets. The first step in this project, as with any woodworking project, is to break down the materials. For this build, I used three sheets of ¾” plywood and one sheet of ¼” plywood. Depending on the grade of plywood you use, the wood will cost you between as little as $90 for sheathing plywood, up to over $200 if you use Baltic Birch plywood. These are the prices in my area, just for reference. I used PureBond maple plywood for this build, and the cost of the plywood was about $175. To breakdown the sheet goods, I used a combination of a table saw, miter saw, and circular saw or track saw. You could use nothing but a circular saw to cut these parts, but maintaining square in your pieces would be much trickier. Ensuring your pieces are square at this point will make the assembly process much easier later on. Another option, if you don’t have access to a table saw, is to have your local home center break down your larger pieces. Be careful though, last time I had my pieces cut at the home center, they left an extremely ragged edge on the plywood. Good for rough cutting, but not great for precision cuts. I break down the sheets of plywood according to the cutting diagram from the plans and number my parts along the way. This makes final assembly of the tool storage cabinet much simpler later on, since I can just reference my cut list and pick the parts I need for each structure. I make these types of plans before building all of my larger projects. It makes for a much more efficient build experience, especially on projects like this that include a lot of small plywood parts. Purchasing these plans from me is a great way to support my future builds, so thanks! Once I had all of my pieces broken down, it was time for assembly of the CNC table. I used pocket holes to assemble the tool storage cabinet carcasses. There are two pieces at the top and two pieces at the bottom of each carcass, and these pieces form the structure. This workstation is essentially just two identical cabinets, which will be placed next to each other and attached through their sides. This design gives the top quite a bit of support, especially through the center, which should help to prevent any sagging in the future. The Shapeoko 3 XL CNC I have weighs over 100 lbs, so I really wanted the top to be well supported. After assembling the carcasses, I cut the 2x2 pieces which will provide the mounting point for the adjustable feet. These adjustable feet are identical to the feet on the Jay Bates Miter Saw Station I built previously, and they work great for leveling your cabinets in a less than level garage shop. I glued the 2x2 pieces into place, added a few 1 ¼” screws, and then installed the feet. The feet are made up of a 5/16” T-Nut and a 2” long, 5/16” stainless steel carriage bolt. For about $10 in hardware, you get eight adjustable leveling feet that will never rust, perfect for a garage shop. Next, I assembled the drawers. I used a tip from Chris Salomone here, check out his drawer boxes video to see his process. I typically use pocket holes to assemble drawers, but I wanted to try this technique, mainly because I was out of pocket hole screws. 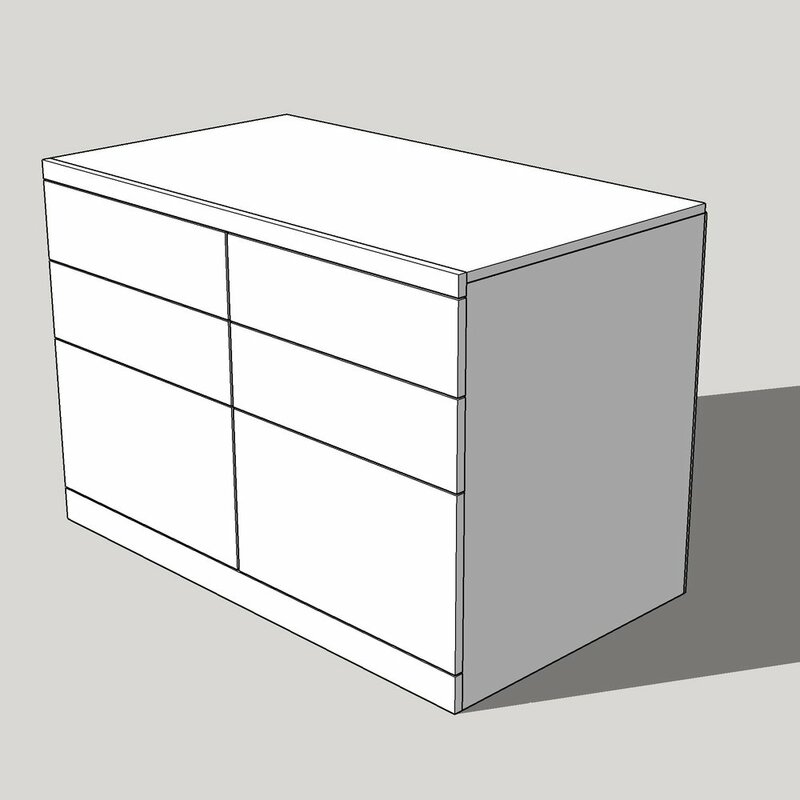 Basically, I cut my drawer bottoms to final size from ¼” plywood, and then assembled the sides of the drawers on top of the bottom, using the bottom as a reference. As long as the bottom of the drawer is cut square, your drawer will also end up square. To do the initial assembly, I used glue and 1 ¼” brad nails, and then followed that up with 1 ¼” countersunk screws. 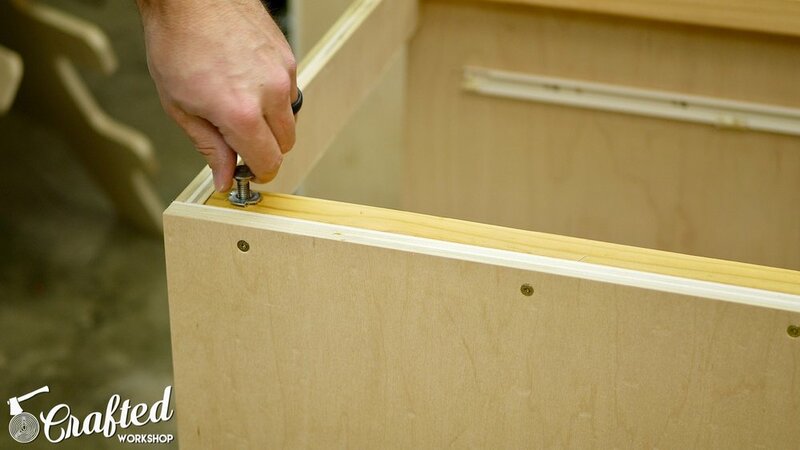 This makes for a super sturdy drawer that can be assembled really quickly. Building and assembling drawers is usually my least favorite part of any cabinet project, just because it’s such a repetitive process, so anything I can do to speed up this process is a welcome relief. After building my drawers, I installed my drawer slides. This is a lot easier to do when you have full access to the cabinets, so I usually try to install the slides before installing the top and putting the cabinet in its final location. I cut a few spacer blocks out of scrap plywood to hold up the drawer slides. This is really helpful in keeping your drawers spaced evenly and making sure they end up level. The sizing of these spacer blocks will depend on the drawer slides you use. After installing the slide hardware to the cabinet wall, I installed the hardware to the bottom of the drawer and then install the drawer into the cabinet. Since these are bottom mount slides, I can then use another set of spacer blocks to install the next level of drawer slides, and continue this process until I’ve installed all of the drawers. I was able to knock out installation of all of these slides in a very short amount of time using this method. With all of the drawer slides installed, I placed the tool storage cabinets in their final location and used the leveling feet to level the cabinets and make them flush with each other. After they were level and flush, I attached them to each other with a few 1 ¼” screws through the side panels. Next, I installed the top. This just simply dropped onto the cabinets and I attached it with 1 ¼” screws through the cabinet carcass below. If you leveled the cabinets well, the top should essentially be dead flat at this point. After the top was installed, I added the front faceplate at the foot of the cabinet. This ties the cabinets together in another location and also gives the bottom of the cabinet a nice, finished look. Again, I used 1 ¼” screws from the inside of the cabinet. Next, I put all of the drawers in and installed the drawer fronts. I cut a ⅛” spacer to go between the drawer fronts, attached the front to the drawer with a couple of spring clamps, and then attached them with 1 ¼” screws from the inside of the drawer. You might notice that there is a bit larger of a gap in the center of the cabinet than there is between the drawers. This is because I accidentally cut the drawer fronts an ⅛” shorter than they were supposed to be. This wasn’t worth fixing, but if you follow the plans, you will be left with an ⅛” gap in the center of the cabinet so that the gap matches. Finally, I attached a piece of hard maple trim to the front edge of the CNC table. This trim helps to keep the front edge of the plywood from delaminating over time due to wear. I attached the piece with brad nails and glue, and had a near miss with a brad nail and my thumb. I posted this clip on my Instagram, @craftedworkshop if you don’t already follow me over there. One tip I saw in the comments there is to make sure your nailer is perpendicular to the piece, not parallel as I have it here. Brad nails have an angled point and are most likely going to turn to the left or right, not up and down. Unfortunately, I learned this after splitting out my top, but luckily the nail didn’t go into my finger. After attaching the trim piece, the DIY CNC Table and Tool Storage Cabinet is basically done. You might want to sand the piece, roundover or chamfer some of the edges, and apply finish. I've had good luck so far with leaving the cabinets in my shop unfinished, but I might go back and add finish to this at a later date. Hopefully, you enjoyed this build! If you don’t already, get subscribed to my main channel and on my second channel. Last, if you want to support me more, use the Amazon affiliate links in the lists at the top of this post. This is a free way for you to support my future projects! Thanks and, until next time, happy building!